I saved a Jedi’s life today. I shouldn’t have done it. It was a stupid risk to take. I’m only a slave, after all, and an alien to boot. The Sith don’t take kindly to a Zabrak like me, especially one who’s efficient, powerful, and unfailingly polite. Actually, many of the Sith don’t take kindly to anyone. They say I should harness my hatred…let it fuel me. But hey, that doesn’t mean I have to be a jerk about it, right? Maybe that Jedi will spread the word that we aren’t all evil murderers. They’ll see that we have only the best interests of the Empire at heart, and we’re only taking what is rightfully ours. This is the philosophy of the Sith Inquisitor character I played in my weekend beta test of Star Wars: The Old Republic. Though I only got through the first ten levels of content, that limited time showed me that a bad guy can still do some good. One of the key differences between The Old Republic and other massively multiplayer games is its reliance on dialogue and storytelling. This is evident from the second you finish creating your character. After watching a lengthy cut-scene detailing the motivations of your faction (Republic or Sith), you’re thrust straight into a personal conversation with your first quest-giver. All the standard trappings you’ve come to expect from developer BioWare are here: a radial response menu with dialogue options, top-notch voice acting, and situations that force moral choices on you. What you might not anticipate is that, even as a Sith, you can be a nice guy. In an early quest, a fellow Sith acolyte had been arrested, and it was my job to interrogate him. My masters encouraged the use of torture to obtain his information. And since I had already been frying critters with my Force Lightning, that route would’ve been easy. Instead, I played the good cop, told him things would go much smoother if he told me what he knew, and even promised to protect him from the killer he would be informing on. Convinced, the prisoner squawked, and my superiors were mollified. But I went a step further, living up to my word. I persuaded the jailor to send the informant off-world, where he would be safer (and less of an incompetent nuisance). He relented, and at the conclusion of the quest, I earned 100 light-side points. Yes, light-side points for a Sith. Despite apparent thematic flaws in the idea (how do you tap into the dark side if you don’t act with anger or hatred? ), you can play through The Old Republic as a noble defender of goodness…who just happens to favor lightning powers and red lightsabers. My time playing the beta didn’t quite make it clear how this will break down in game terms. 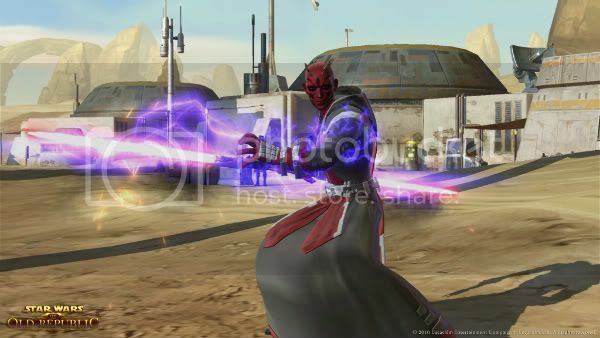 In previous Old Republic titles, leaning to one side of the Force or the other granted access to different, distinct powers. That won’t be the case here, and you won’t suddenly switch factions if you accrue enough points. According to BioWare’s community forums, certain gear or titles will only be available to those of a specific alignment. Non-player characters will also react differently in dialogue options, though I didn’t get a chance to see that aspect. But the point is that my principled, polite, good-hearted Sith Inquisitor is an entirely valid option in the world of The Old Republic. And that alone makes me curious enough to see where his story might go when the game hits store shelves on Dec. 20.